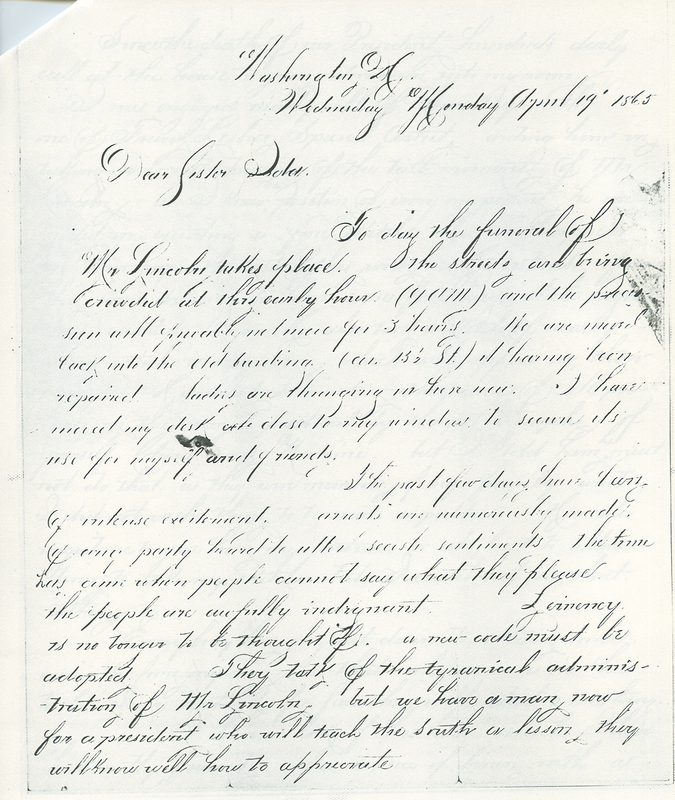 Willie Clark, the Petersen House boarder who lived in the room in which President Lincoln died, wrote to his sister four days after Lincoln's death. He described the scene in Washington, including funeral preparations, the hunt for the killers, and, most notably, souvenir hunters who daily came into his room. Clark himself kept some souvenirs, and sent others to his sister. To day the funeral of Mr. Lincoln takes place, the streets are being crowded at this early hour. (9 A M) and the procession will probably not move for 3 hours. We are moved back into the old building (Cor. 15 1/2.) It having been repaired. Ladies are thronging in here now, I have moved my desk close to my window to secure its use for myself and friends. The past few days have been of intense excitement. Arrests are numerously made, of any party heard to utter secesh sentiments. The time has come when people cannot say what they please, the people are awfully indignant. Leinency is no longer to be thought of. A new code must be adopted. They talk of the tyranical administration of Mr. Lincoln, but we have a man now for a president who will teach the south a lesson they will know well how to appreciate. Since the death of our president hundreds daily call at the house to gain admission into my room. I was engaged nearly all of Sunday with one of Frank Leslies Special Artist aiding him viz making a correct drawing of the last moments of Mr. Lincoln, as I knew the position of every one present he succeeded in executing a fine sketch, which will appear in their paper the last of this week. He intends, from this same drawing to have some fine large steel engravings executed. He also took a sketch of nearly every article in my room which will appear in their paper. He wished to mention the names of all in the room particularly the pothographs of yourself, Clara and Nannie, but I told him he must not do that, as they were members of my family and I did not wish them to be made so public. He also urged me to give him my picture or at least to allow him to take my sketch, but I could not see that. either. Everybody has a great desire to obtain some memento from my room so that whoever comes in has to be closely watched for fear they will steal something. I have a lock of his hair which I have had neatly framed, also a piece of linen with a portion of his brain, the pillow and case upon which he lay when he died and nearly all his wearing apparel but the latter I intend to send to Robt Lincoln as soon as the funeral is over, as I consider him the one most justly entitled to them. The same matrass is on my bed, and the same coverlit covers me nightly that covered him while dying. Enclosed you will find a piece of lace that Mrs. Lincoln wore on her head during the evening and was dropped by her while entering my room to see her dying husband It is worth keeping for its historical value. The cap worked by Clara and the cushion by you, you little dreamed would be so historically connected with such an event. I received your letter but before I answer it I must see what I can do. With that exception I have not received any letters although you blame me for not writing when to my knowledge I have written four, and you must be aware I am very anxious to hear about mothers health which in your letter you did not mention. I wrote auntie a letter about a week ago and enclosed a love letter to Ella promising to marry her when I get to be 21. Remember me to Henry Littlefield. Tell him I shall write him soon. Remember to Mrs . Little and family and all enquiring friends. and Clara, and dont forget you have a brother and send me a longer note soon. Please not give away any of this lace, out of our own family.